Today's tutorial is inspired by several things - primarily Bette Davis and Clara Bow, and their ridiculously huge eyeballs, but also a blending of original flapper smokey eye makeup, and 21st century Japanese "Gyaru" style makeup - AKA, creepy doll eyes. 1. Rim your eyes in black eyeliner, going along the lash line on the top lid, but UNDER the lash line on the bottom lid. You are creating a little slice of space below your natural lash line. 2. With WHITE eyeliner, fill in the area beneath your lower lash line. 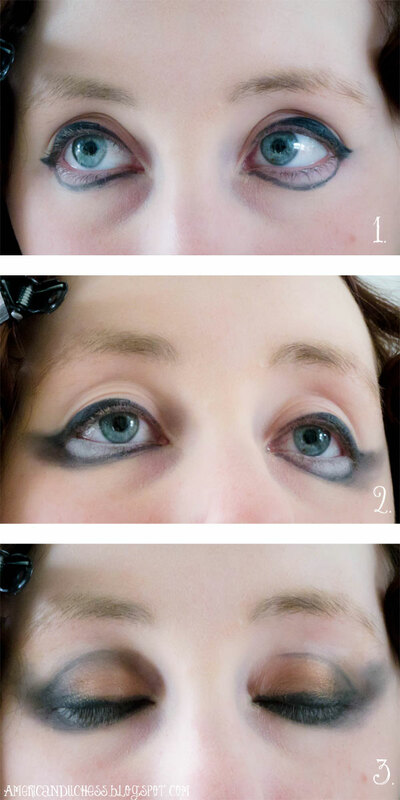 Also white-out your waterline (the skin between your lower eye lashes and your eyeball) Then, with black powder, smudge out the black lines you drew, to give the smokey effect. 4. Continue to darken and blend the eye shadow. If you desire a stronger, darker line on your upper lash line, use a liquid eyeliner to draw the line and wing. 5. Now it's time for lashes. You can use several sets of lashes on the upper AND lower lids (I've done just upper lids for this tutorial, but I used 2 types of false lashes). Trim the inside corners of the false lashes to fit your eyes, then run a little glue along the edge, wait about 30 seconds to set, and place on your upper lash line. Applying false eyelashes takes practice, but you'll get the hang of it (hey, if I can do it, you can too). 6. Here's how the false eyelashes effect the overall look. The eye on the right has lashes, the eye on the left does not. For an even bolder look, add false eyelashes to the bottom lid, along the black line. 7. Now both sets of lashes are on, and the look is done! If you want to darken the eyeliner or shadow more, go for it, until you have the smokey effect you want. 8. If you want to add the iconic cupid's bow lip to your look, first draw the shape on your lips with lip pencil. 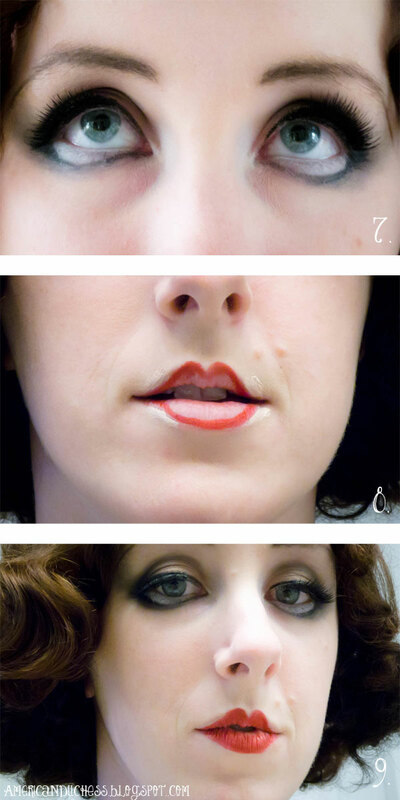 You want to draw INSIDE your natural lip line. To hide your natural lip line, apply concealer to the outer edges on top and bottom, and blend with your skin. 9. Fill in your lips with a nice bold, matte red lipstick. For the '20s look, you don't want anything with shimmer or glitter in it...just bold, flat red. Here's the finished look! Up close, you can easily see the white eyeliner drawn in under the eyes, but from a couple feet away, it just looks like you have FREAKING HUGE EYES. 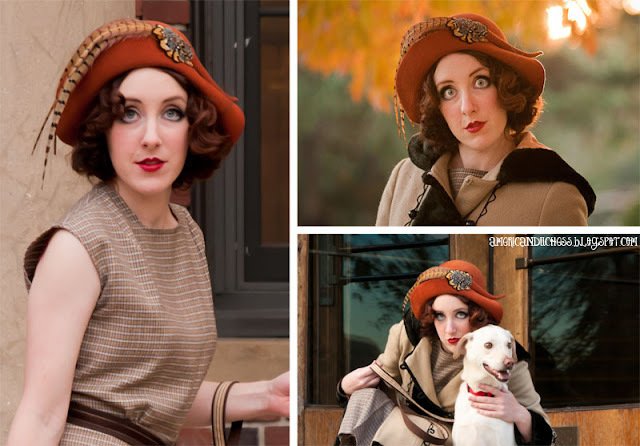 This look can be toned down or exaggerated even more, and used for a 1920s-inspired look or even 1960s (Twiggy used similar tricks, even). It's all about illusion! I learned how to do this style of makeup from these helpful tutorials. I hope you enjoy! What a great tutorial! Thanks, Lauren! Love your outfit and the effect of the makeup from a distance. Great effect! It really does look fairly realistic from further off.